After nearly 20 years, we're finally getting that sequel to Deep Blue Sea that just enough people want to justify its existence. Thomas Jane won't be back, but SyFy is releasing Deep Blue Sea 2 in 2018, though, a specific release date has not yet been set. What's also good for fans of the original to hear is that the sequel has been given an R-rating for creature violence and gore, and for language. Everything one could possibly want in a movie about scientifically altered, super deadly and smart sharks. In Deep Blue Sea 2, the plot kicks off with shark conservationist Dr. Misty Calhoun invited to consult on a top-secret project run by pharmaceutical billionaire Carl Durant (Michael Beach). Calhoun is shocked to learn that the company is using the unpredictable and highly aggressive bull sharks as its test subjects. You can probably guess where this goes next, and Warner Bros. teases some "personality" from the sharks that'll be menacing these hapless humans. Matt Bierman, creative executive for Warner Bros, recently had this to say about the upcoming sequel. "We are a true sequel. We wanted to keep to the spirit of Deep Blue Sea and why people love it. The research that was used on the sharks in Deep Blue Sea 2 comes from the mythology and story line of the first movie. We have given the lead shark a personality and hope the fans will embrace that as it really helps the storytelling and the narrative in a way that first one didn't. Deep Blue Sea 2 has a slightly slower build but once the rubber band snaps things go boom really quickly!" The slower build could have to do with the fact that this movie has a lower budget and that they can't have as much action in it, if they want it to look good that is. But that just means the B-movie, shark action we do get could be totally worth it. The cast for Deep Blue Sea 2 includes Danielle Savre, Rob Mayes, Darron Meyer, Nathan Lynn, Kim Syster and Michael Beach. The sequel was directed by Darin Scott (Dark House) and was filmed over the summer in Cape Town, South Africa. The original Deep Blue Sea was released in 1999 and, though a little successful at the time, it's truly gained cult status over the years. Even if it's on the opposite end of the spectrum, it's arguably the second-best shark movie ever made, next to Jaws. 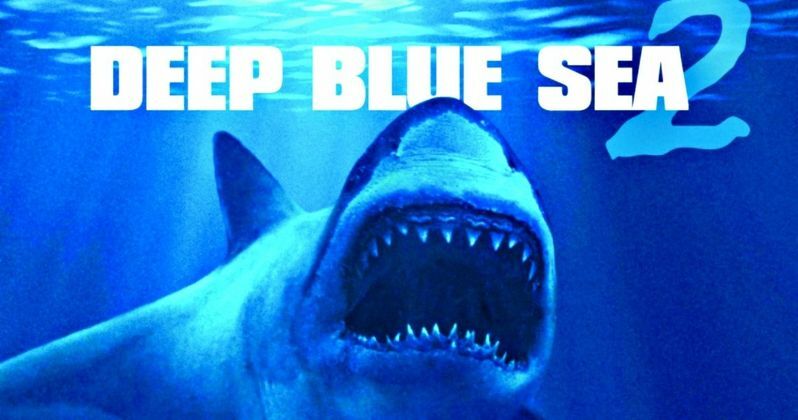 With hits like 47 Meters Down, the Sharknado movies and The Shallows, there's been a renewed interest in shark movies, which is likely why Deep Blue Sea 2 is happening. UHM doesn't make it clear if and when the movie will be released on Blu-ray/DVD, or if it will just air on SyFy channel. There's also no word on a theatrical release of any kind. Either way, you'll be able to see this movie next year. Deep Blue Sea 2 Was Going to Be Insane, Why Didn't It Happen?